I relish the opportunity to try new desserts. This time around, guests were coming for dinner and I was planning on serving short ribs, so obviously we would need something chocolatey to follow the main course. I chose this beautiful Triple Chocolate Mousse recipe, partly because I love chocolate mousse and am in search of a go-to recipe, and because I knew I wanted to make a dessert without flour. AND the idea of a layered triple mousse sounded awesome and super impressive if I could pull it off. 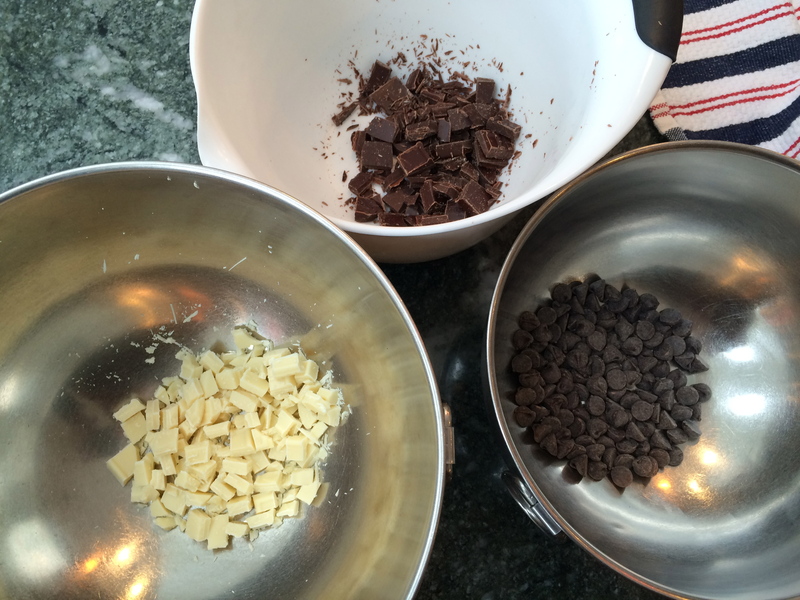 After checking the pantry, I found 60% chocolate, white chocolate, and semi-sweet chocolate chips. I wasn’t sure how much of a difference in taste there was between the two chocolates, so I ended up adding some Kahlua liquor to the semi sweet chocolate chips later. This recipe also used a surprisingly small amount of sugar (2 Tbs for the whole thing), which was great. 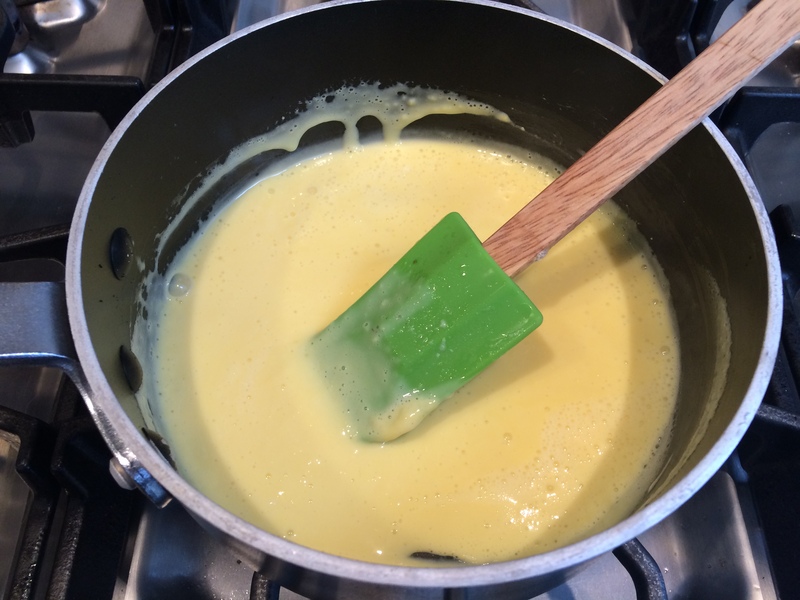 Here you can see the custard that served as the base for the mousse. You may notice a lack of photos midway through the process . . . this is because I had some issues melting the chocolate and so had to improvise a bit to achieve the smooth and glossy texture you are looking for. It was totally a miscalculation on my part, and nothing to do with the recipe though, which means that once the chocolate actually was melted the whole process continued smoothly. Note to self: next time use shallower glasses so you don’t have to fill ‘er up with so much whipped cream at the end. Ah, whatever, the whipped cream was a nice base for the raspberries. 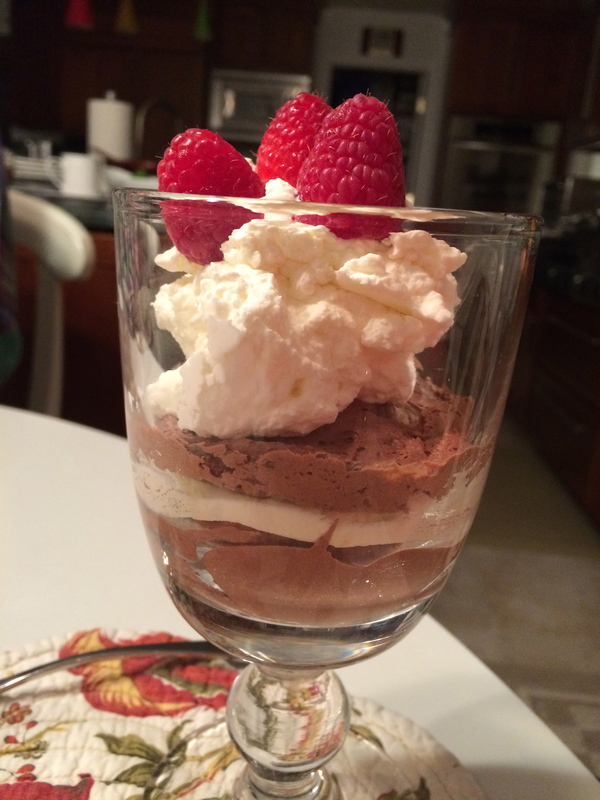 Chocolate mousse and raspberries are another perfect combination, in my opinion. Here you can see the layers of the chocolate, which is achieved by allowing each layer to slightly freeze before you add the next layer. Ah, this was sooooo good, both taste-wise and texturally. I seriously can’t wait to make it again . . . and take better pictures of it . . . sorry, the anticipation level was too high by the time I finally got to try this!